There is a tremendous engagement and execution gap in companies today. According to Gallup, only 13% of employees are actively engaged in their work ; 60% of employees don’t understand their organization’s goals and priorities and just 10% of executives sustainably achieve those goals according to Bain & Company’s Chris Zook. 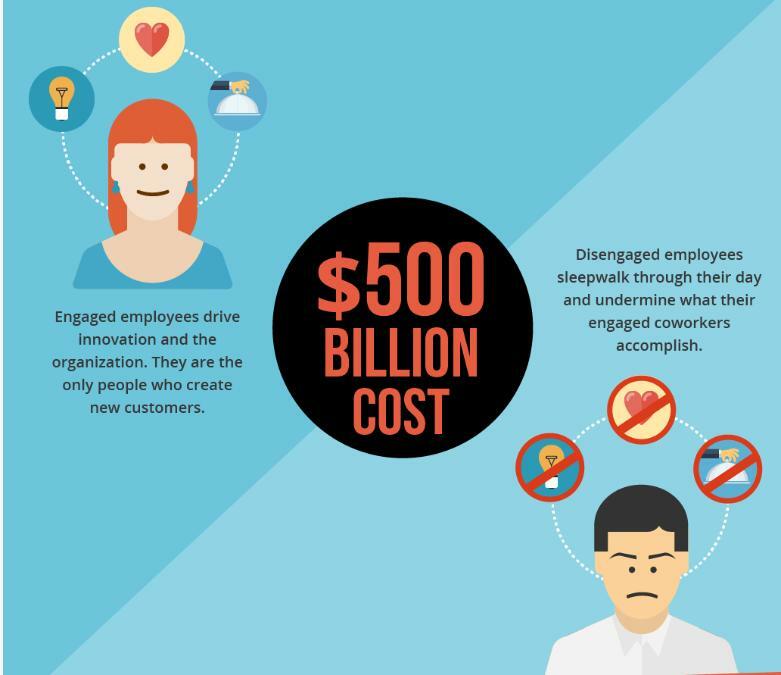 In fact, disengaged employees may actively undermine the value created and customers acquired by their more engaged peers – whom they far outnumber. 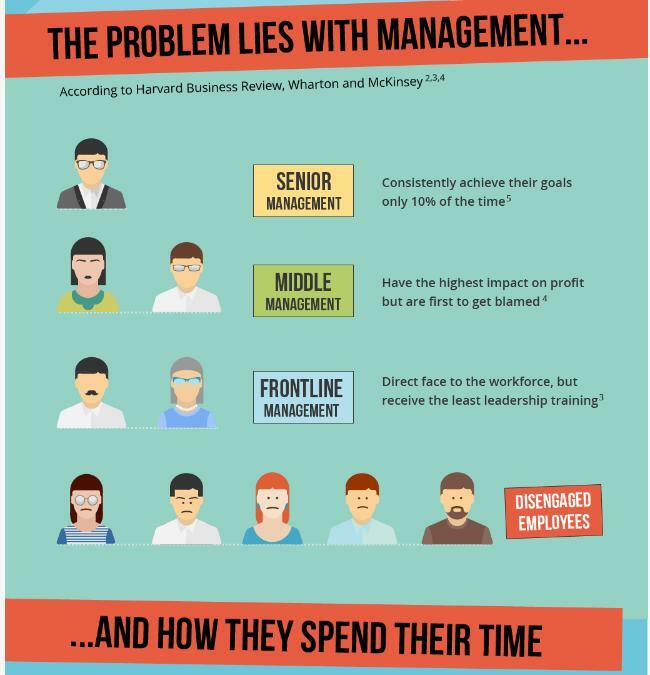 Experts at Gallup and Harvard Business Review agree that the cause of the problem and its $500 billion annual cost is managers at all levels and how they spend their time. In fact, Harvard Business Review article “Blue Ocean Leadership” posits that the bulk of that time is consumed by low-impact tasks like getting facts and preparing and reviewing status reports. This leaves little time for leadership activities that drive positive engagement and performance, such as setting strategy, communicating goals, empowering teams to execute, coaching and creating learning environments. To compound matters, frontline managers receive the least training of all roles and are least prepared to be great at the job of managing and leading, according to McKinsey — yet that’s whom employees engage with the most. 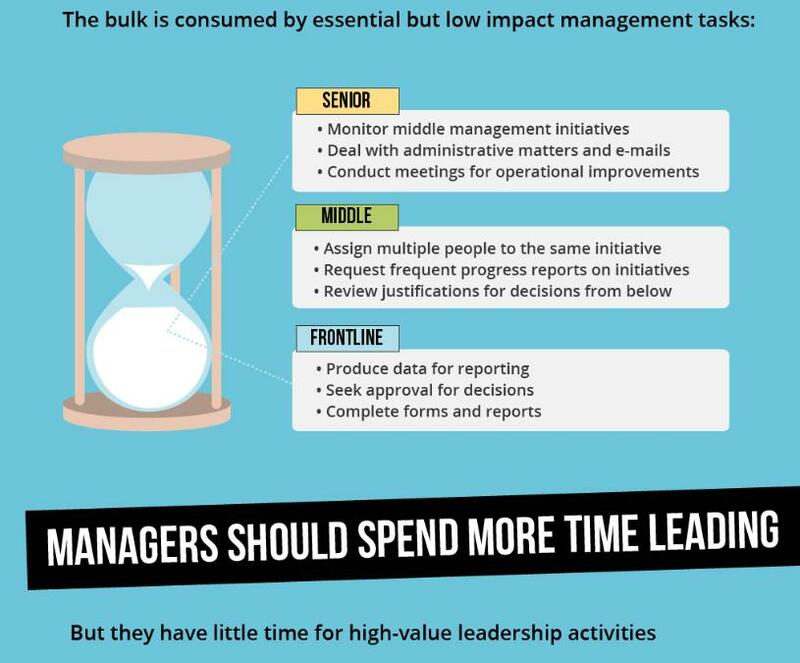 Middle managers have the highest potential impact on the bottom line according to Wharton, but may lack the authority to execute for impact (and are an easy target of blame from both above and below). Business has gotten far more complex and teams more global, but the tools for communicating and linking goals, actions, status and feedback haven’t improved in 20 years. PowerPoint dashboards hand created week after week with progress against goals, dozens of versions of Excel spreadsheets with the list of deliverables, SharePoint and Connections sites with the documents detached from the status of the deliverable and abandoned comments, infinite emails that only 30% of the team takes time to file neatly away and status meetings and read outs are still the time-sucking methods of communicating goals, actions, status and feedback for most managers. It’s no wonder managers have little capacity left to engage their teams or lead to their full potential! And of course no one upline is letting them off the accountability hook and few high performing managers believe they can achieve their career goals without measuring team goals and execution progress. My own experience as a highly motivated senior manager at IBM, an organization with over 400,000 people globally, is days are very long if you try to cover essential management tasks, vital leadership activities and maintain or build expertise in a domain. Something has got to give if we are to increase leadership capacity and it isn’t the 24-hour day. 1. Make communicating goals and priorities a priority: Your time is well spent communicating goals, objectives and priorities to the team. They can’t achieve them if they don’t know what they are; repetition of goals pays off when they encounter a lot of data, noise and distraction every day. 2. Be clear and specific on the work to achieve goals: Doubt about ownership and the actions needed to achieve goals wastes a ton of time. Make sure everyone knows what’s required to achieve your goals, hand offs within the team are smooth, ownership is clear and people feel accountable for execution. 3. Be hyper-efficient in getting status from your team: Track a consistent list of the actions needed for goal achievement and current status to ensure people don’t waste time on immaterial work and you have transparency on the progress of important work. Avoid reconstituting the actions list or status framework each week – it makes facts harder to get or trust. Set an interval to check status rather than doing it haphazardly throughout the day. 4. Give immediate and real feedback to the team: Be consistent in giving feedback to all your team members (not just the super stars). Link the feedback to actions and goals for the biggest impact. Both positive and negative feedback are essential to engaging your team and achieving your execution goals – so don’t short change this part of the management job. Looking for more efficiency and capacity? Leaders like Rani Hublou at OneLogin, Stephanie Leffler at CrowdSource, Shahed Islam at SJ Innovations and Mike Masterson at Compuware use WorkBoard to improve the efficiency with which they communicate goals and priorities, actions, status and feedback. Hublou, One Login’s CMO, says, “WorkBoard increases my leadership capacity. I can manage a larger team and have more strategic impact.” Leffler, CEO at CrowdSource, agrees: “I can manage where my time goes, which is critical and hard to do. I use WorkBoard to manage my own priorities and to do list as well as keep the team aligned with our strategic goals.” Shahed Islam’s team has cut email volume by 80% and touts much higher productivity and far less stress – the hallmarks of great execution and engagement. WorkBoard connects team goals to individuals’ action item lists, enables transparency and collaboration across the team, automates status reporting and provides scorecards on collective action items. Feedback is easy to give instantly and better to receive with badges including trophies, thumbs up and missed bullseyes. WorkBoard is available for download at www.workboard.com for managers looking for a boost in their leadership capacity. 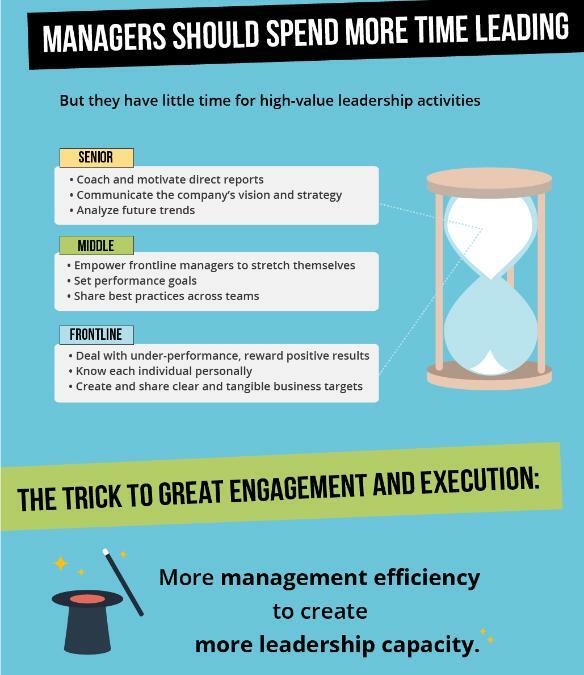 Get the full infographic on the managers' dilemma here.